Zeusvision levels the outdoor advertising playing field in an exciting and innovative way and makes it affordable for anyone to get their message out. You’ll be hearing a lot more about Zeusvision in the days and months to come. Let’s start with a closer look now. Here’s a great way to look at it in a nutshell: Think of Zeusvision as a huge iPhone™ on wheels that can position itself wherever the client desires, delivering customized multimedia messages and experiences for as little as $99. Today’s tech makes it possible to do things unheard of, or just beyond reach, a generation ago. So, it makes perfect sense, and it’s perfect timing, for Zeusvision, digital double decker buses that can get your message out into hot spots, with lots of people traffic, at a price anyone can afford. Have you ever thought, “It sure would be cool to propose to my sweetheart on that billboard by her office,” or “I would love to show my son in a grand way how proud we are of his service for our country when he comes home from the war,” or maybe “I wish our little start-up company could compete with those big guys advertising on billboards in Silicon Valley”? Maybe there was some other occasion where a large outdoor display ad or flashy promotion or billboard would have been the perfect solution. You just could not afford it without mortgaging your house for the cost of advertising. The fact is that the outdoor advertising game has been rigged to favor those with deep pockets. Large scale outdoor advertising in big cities is tied to the real estate where the billboards are located. It has also been controlled to a large extent by the licenses and permits that are issued for these display signs to be erected. As a result, there has been a giant price tag required to use these large but otherwise static advertising mediums. To complicate price matters even more, media business buyouts and consolidations have led to a few mega-media firms like Clear Channel, Lamar, Fairway, CBS and others controlling a sizable portion of these advertising mediums in the United States. In recent years, technology has improved so that these billboards are no longer static. The price, of course, has gone up for these fancier billboards, leaving the ability to use them in the hands of the wealthier companies and individuals. Often technology comes along and spurs new innovation and creates new players in the game. This is what happened at Zeusvision. The founders at Zeusvision saw a new opportunity with these large multimedia signs. They realized that perhaps these billboards didn’t need to be dug in at a single location and mounted on poles. 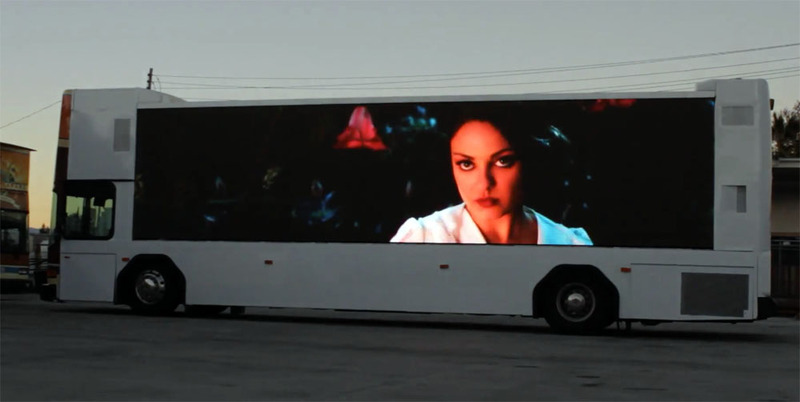 They thought to themselves, “What if these multimedia billboards had wheels and an engine?” That spark of inspiration bloomed into the Zeusvision digital media bus with 31-foot, full-color, multimedia displays on either side. Now their billboards were free to roam anywhere, not tied to a piece of expensive real estate, not tied to the same “billboard” regulations that the mega-media companies were saddled with. Often inspiration comes with side benefits. While social media campaigns like those on Facebook™ and Twitter™ certainly add volume to the voice of the people, it still does not level the playing field. “Location, Location, Location” is the familiar mantra of a number of businesses. Media and advertising still benefit greatly from the perceptions of location. A billboard in Times Square is going to be seen by viewers as originating from a more successful company than a billboard in New Jersey. Likewise a video display on Rodeo Drive in Beverly Hills will get more attention than a billboard in East L.A. It is simply a result of years of popular media conditioning. Zeusvision will remove the roadblocks that prevented you from advertising in these prominent locations. Zeusvision is launching a public campaign to bring affordable, mobile, multimedia advertising to most major U.S. cities in 2015. Zeusvision promises a revolution in advertising and personal messaging. Not only will Zeusvision’s digital media buses deliver stunning 31-foot video advertising, but their team of technologists will be adding an array of unique features that the “big guys” don’t offer. Zeusvision is including on-board technologies, like GPS, cameras, inertial motion sensors, light sensors, eye tracking, gesture tracking, real-time GPU processing, and other tech packages they are still exploring that allow your graphics and video to interact with the public in ways never dreamed before. They will release their Software Development Kit (SDK) and Application Programming Interface (API) in Q1 of 2015 so other developers can participate. Think of Zeusvision as a huge iPhone™ on wheels that can position itself wherever the client desires, delivering customized multimedia messages and experiences for as little as $99. Imagine this: Robert has been dating Sally for six months. He has decided to ask for her hand in marriage but wants to do it in spectacular fashion. He goes to his computer, downloads a graphics template from the Zeusvision website and makes a graphic with her picture on it with text asking her to marry him. Next he uploads the proposal image and schedules the time he want’s his proposal to play. Because Zeusvision buses have a route with fixed times and geo-locating ads, Robert schedules his proposal to play on a specific street at 12:00 noon where his fiancé-to-be will be joining him for lunch at an outdoor cafe. As Zeusvision approaches the cafe he receives a text alerting him that his Zeusvision bus is only 5 minutes away. Once Zeusvision is in sight he directs Sally’s attention to his proposal graphic. Once she realizes that she is looking at herself on a giant screen bus and she is also being proposed to simultaneously, surprise turns to excitement and hopefully a yes to his question (and happiness ensues). This is an example of messaging technology being used to increase the quality of someone’s life.